A number of protests took place in Dublin this week as the 26-County government faced a mounting corruption scandal and a wave of anger over policies which favour the wealthy over the poor. The trigger for most of the protests was the payment of a billion euros to international speculators who were facing a loss on their investment in the collapsed Allied Irish Banks (AIB). The final year’s interest was also paid, equating to an additional 45 million euro on top of the billion euro capital. The repayment of the bond is the latest in a series of EU-mandated government giveaways to international bondholders. This week’s payment brought to more than 18 billion euro the amount that the government has paid to all classes of bank bondholders this year. Sinn Fein finance spokesman Pearse Doherty said the payment of the bond was “further evidence of the government’s failure to deal with the debt crisis”. The payment was “totally unacceptable”, he said. The 26-County administration should have put a plan in place months ago to deal with these bonds, signalling the State’s inability to pay, he added. Protests are slowly becoming more confrontational. 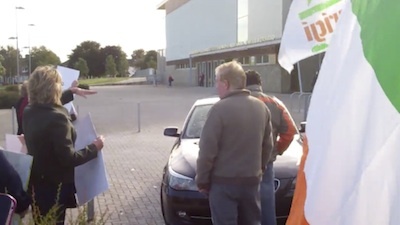 This [Friday] morning, the Tanaiste and Minister for Children were forced to abandon an event in west Dublin after their car was surrounded by protesters. Eamon Gilmore and Frances Fitzgerald were due to attend an event in the highly deprived Ballyfermot area of Dublin. A number of disgruntled members of the local community joined members of Eirigi and People before Profit for the protest. When the Ministerial car arrived at the event, protesters surrounded the vehicle, and some threw eggs. The car stopped for about two minutes. Eirigi said the protest showed “a spirit of resistance that is badly needed across this country”. “For too long the people have been silent, obediently accepting bank bailouts, tax hikes, wages cuts and attacks on public services and social welfare,” said Eirigi Councillor Louise Minihan, in a statement. A number of other protests took place this week against the bondholder payments. Sinn Fein staged a protest outside AIB’s branch on O’Connell Street, while the Campaign Against Household and Water Taxes demonstrated outside AIB’s headquarters in Ballsbridge. A number of Occupy Dame Street supporters occupied AIB on Grafton Street. In a statement, the group said it had occupied the bank in protests of the payment “that we have no obligation to pay”. The Dublin government is already under immense internal strain following accusations that Minister for Health James Reilly acted corruptly to locate a primary care centre on land owned by a Fine Gael supporter. Last month, before she quit her post in outrage, Labour’s junior Health Minister Roisin Shortall revealed the site was among those moved to the top of a priority list for the location of primary care centres. The further revelation this week that the site was owned by developer Seamus Murphy, a long-time Fine Gael supporter in the Minister’s constituency, sparked a storm of denials. Although Fine Gael and Labour Ministers appear to have accepted Reilly’s claim that he had not acted improperly in the matter, his office’s initial denial -- that the previous government had been responsible for identifying the site -- had to be withdrawn. Minister for Education Ruairi Quinn stood accused of misleading the Dublin parliament after he was humiliatingly forced to retract that statement as untrue. Meanwhile, Shortall’s open feud with Reilly and the Labour Party hierarchy is undiminished after the Tanaiste and Labour Party leader Eamon Gilmore insisted that two (unnamed) health officials had assured him that Reilly was “not involved” in the allocation of primary care centres in his constituency. Despite Gilmore’s statements, the Labour party is on the verge of a split over the affair, with two Labour MEPs calling for Reilly’s resignation. Labour party chairman Colm Keaveney urged party members not to engage in “internal strife” ahead of an expected backlash over the December budget. Many party members had contacted him and “expressed disquiet at the events surrounding that resignation and with a number of other issues”, he said. “The next few months will be the toughest of our time in the current Government and I am appealing for party unity in the face of this challenge”, he said.